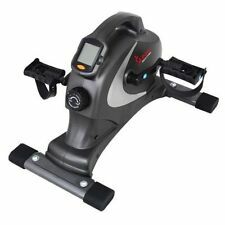 Sunny Health & Fitness Foldable Semi Recumbent Magnetic Bike in black Condition is New. he solution to a complete, customizable workout, the SF-B2710 Total Body Bike is not only a great indoor cycle for cardio, but resistance bands help you tone and strengthen your arms and legs, too. Let Sunny Health and Fitness keep your workouts on track with the SF-RB4631 Recumbent Bike with Arm Exerciser. Keep track of workouts with the integrated digital monitor. Control your workout intensity with 8 levels of magnetic resistance. This versatile and reliable recumbent bike with arm exerciser has a large seat and back cushion with adjustable height for users and various sizes. Features: Dual actionDigital displayPortableMagneticAssembly requiredPulse grips onlyStandard with strapsWeight capacity of 301-350 poundsAdjustable53 inches long x 24 inches wide x 54 inches high Assembly requiredAssembly Required. So put us in your favorites. and children in our community. Achieve a full body workout and burn more calories with Cross Training Magnetic Recumbent Bike. The magnetic tension system allows users to quickly adjust the tension up or down to increase the effectiveness of the workout. 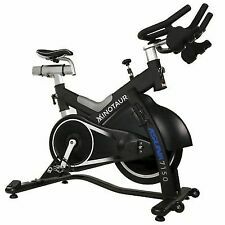 Sunny Health & Fitness Indoor Cycle Trainer - 30 lb. Flywheel, Red. Sunny Health & Fitness has been importing and distributing high-quality health and fitness products for over ten years. Adjustable resistance and 30-lb. Feel great while you lose weight with the SF-B2721 Comfort XL Folding Recumbent Bike by Sunny Health and Fitness. Lightweight and compact, (38 lbs) this upright bike is designed for maximum comfort while still helping you achieve your unique fitness goals. 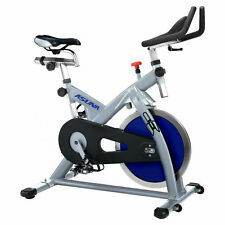 The indoor cycling exercise bicycle SF-B1203 is a great priced quality bicycle. Enjoy your successful quality workout start toning your body core and legs muscles. Adjustable resistance for variable fitness workout levels intensity. Sunny Health & Fitness has been importing and distributing high-quality health and fitness products for over ten years. Manufacturer's warranty included. Adjustable magnetic resistance. Sports & Fitness. Get into shape with the Sunny Health & Fitness Indoor Cycling Bike. This bike is suitable for cyclists of various levels as the resistance knob allows you to adjust the intensity of your workout. Available in Silver or Red. Cycling is a healthy, low-impact exercise that can be enjoyed by people of all ages. Keep water and sweat off of your flywheel. Seamlessly monitor your heart rate on the LCD monitor with the pulse sensors (heart rate belt compatible). The Sunny Health & Fitness Magnetic Mini Exercise Bike is expertly designed for maximum performance and portability, with a maximum user weight of 220 Lbs. 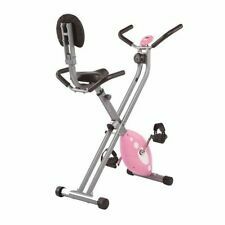 NEW Sunny Health & Fitness Magnetic Mini Exercise Bike SF-B0418. 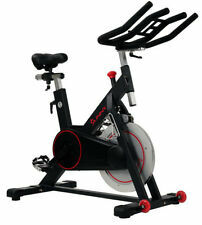 Cycle your way to fitness on this heavy-duty indoor cycling bike from Sunny Health Fitness. The bike's quiet operation lets you watch TV or movies as you work out. - Front wheels make it easy to move this 85lb cycle out of the way. Sunny Health & Fitness has been importing and distributing high-quality health and fitness products for over ten years. Magnetic mini stationary bike with handle for easy portability. user weight capacity. Model No. : 5100. - Wheel Gear System: Fixed Wheel. You have our word that we will do everything we can for you. - Max user weight of 300 lbs. - Warranty: 5 Year Manufacturer’s Warranty. Tension System: Magnetic Tension. - Resistance Levels: 8 Levels. - Large seat and back cushion with adjustable height for users various sizes. You have our word that we will do everything we can for you. Read a book, surf the Web as you get in a great low-impact cardio workout whenever you’d like with the spacious connectable desktop. There is no need to limit your cycling to “before or after work” when you can do both comfortably with the Sunny Health & Fitness SF-RBD4703 Convertible Works Recumbent Bike. Switch up the intensity of your workout with the convenient tension knob. Perfect for any user's skill level! Ensure your feet are securely in the right place with these dual-sided pedals with added foot cage feature. Switch up the intensity of your workout with the convenient tension knob. Perfect for any user's skill level! Take multitasking to a whole new level! Get "work" done with this spacious connectable desktop while you get in a great, low-impact cardio exercise. Sunny Health & Fitness has been importing and distributing high-quality health and fitness products for over ten years. 8 levels magnetic resistance system. Cushioned adjustable seat. Manufacturer's warranty included. 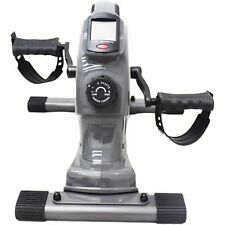 Sunny Health & Fitness SF B0418 Magnetic Mini Exercise Bike Gray. The Sunny Health & Fitness Magnetic Mini pedal exerciser is expertly designed for maximum performance and portability, with a maximum user weight of 220 Lbs. This solid and sturdy bike is designed to perform at the highest levels and is an excellent for high intensity and steady state types of training. Top of the line engineering has gone into many details to make the riding experience more enjoyable and yield fitness results. 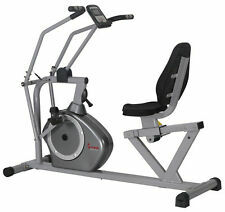 NEW Sunny Health & Fitness Recumbent Bike With Arm Exerciser SF-RB4631. Switch up the intensity of your workout with the convenient tension knob. Perfect for any user's skill level! The seat can be adjusted for proximity to handlebars! Functional fitness training with the Incline Plank Standing Stepper Bike. Body weight and resistance are combined to effectively enhance your cardio workout. The trainer features an LCD display and pulse grip heart rate monitoring to keep up with your overall workout goals. Large seat cushion with adjustable height for users various sizes. Switch up the intensity of your workout with the convenient tension knob. Perfect for any user's skill level. Resistance and Tension. Unleash your inner beast with the Sunny Health and Fitness SF- B1714 Evolution Pro Magnetic Belt Drive Indoor Cycling Bike. Experience a smooth ride as you grip the sweat-resistant four way adjustable handlebars. Sunny Health and Fitness Magnetic Recumbent Bike,Free Shipping! Feel the burn on the Sunny Health & Fitness SF-RB921 Magnetic Recumbent Exercise Bike. This exercise bike features a magnetic resistance system that manually adjusts for 8 levels of intensity and hand pulse sensors that let you monitor your heart rate as you burn off calories. Dual water bottle holders allow you to keep drinks right at your side. Unit features combination clip/cage pedals. weight capacity. 2 water bottle holders. Micro adjustable resistance system. Micro adjustable resistance system. Sit back and workout with the SF-RB4616 Easy Adjustable Seat Recumbent Bike. This bike allows for forward and backward adjustment of the seat without having to get up. The self leveling pedals make it easy to place your feet in the straps. Maximize your workouts with the adjustable 8 level magnetic tension control system. Track your workout progress with the LCD digital monitor that displays: Scan, time, speed, distance, calories, odometer and heart rate. Convenient handles with pulse grip sensors will allow monitoring heart rate and workout intensity. The recumbent bike has built in transportation wheels for easy portability. The extended weight capacity can hold up to 300 pounds. Start today towards a healthier and happier you with the Sunny Health and Fitness SF-RB4616 Easy Adjustable. Achieve a full body workout and burn more calories with Cross Training Magnetic Recumbent Bike. The moveable handle bars transform this recumbent bike into the ultimate low impact home fitness machine. Handle bars move back and forth while pedaling involving, the arms, back, and shoulders, this will increase the amount of effort during the entire movement resulting in increased calorie expenditure. The magnetic tension system allows users to quickly adjust the tension up or down to increase the effectiveness of the workout. The belt drive mechanism makes the bike virtually silent during the pedal stroke for a smoother ride. Self Leveling pedals make placing feet in and out effortless. The digital monitor displays all the basic workout functions: Speed, Time, Distance, Calories, and Total. Maximum user weight 350 Lbs. - Model No. : 5150. - Wheel Gear System: Fixed Wheel. - UPC: 815749018052. - Adjustable Inseam Height: Max 41 in / Min 27 in. - Flywheel Weight: 37.5 lbs. - Warranty: 5 Year Manufacturer’s Warranty. Work out while you work. Don’t just be active be productive with the Sunny Health & Fitness SF-BD2701 Convertible Works Folding Bike! 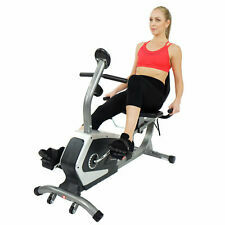 Sunny Health & Fitness Exercise Desk Bike, Magnetic Resistance, Belt Quiet and Large Work Surface - SF-BD2701. 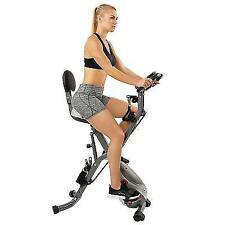 NEW Sunny Health & Fitness Cross Training Magnetic Upright Bike SF-B2630. Switch up the intensity of your workout with the convenient tension knob. Perfect for any user's skill level! The seat can be adjusted for height and proximity to handlebars! Featuring pedals that accommodate both clip-in cycling shoes and standard gym sneakers, this bike is fit to suit any rider’s preference! The heavier the flywheel, the smoother the ride! The seat can be adjusted for height and proximity to handlebars! Make the most out of your day with this workstation recumbent bike that takes multitasking to a whole new level. 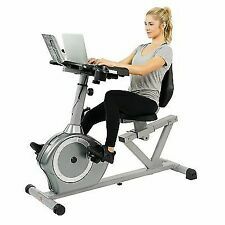 Read a book, surf the Web as you get in a great low-impact cardio workout whenever you'd like with the spacious connectable desktop. STEP-THROUGH DESIGN - Allows easy access for quickly seating in and out of your Recumbent that is created for less fuss, safer, and less strain on your back and legs. No more mounting and dismounting, and certainly no more obstructions. There is no need to limit your cycling to "before or after work" when you can do both comfortably with the Sunny Health & Fitness SF-RBD4703 Convertible Works Recumbent Bike.Assembly Required. Large seat cushion with adjustable height for users various sizes. 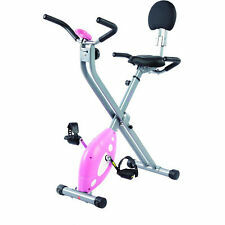 Sunny Health & Fitness Cross Training Magnetic Upright Bike Exercise Bike w/ Arm Exercisers and LCD Monitor -SF-B2630. TENSION SYSTEM: Magnetic. Unleash your inner beast with the Sunny Health and Fitness SF- B1714 Evolution Pro Magnetic Belt Drive Indoor Cycling Bike. 44 Pound Chrome Flywheel designed for maximum stability forces momentum forward in your legs. Magnetic resistance is designed to increase tension easily with the resistance control while staying low maintenance and silent. Experience a smooth ride as you grip the sweat-resistant four way adjustable handlebars. 4 way adjustable seating allows you the comfort to fit properly on the cycling trainer. Invest in your health with the Evolution Pro Bike meant to last!Assembly Required.